AINVSA appreciates and wholly acknowledges; kudos to NVS for its new draft of Transfer Policy 2014. Thanks for making it come down to 5 years in case of Request Transfers and some new staff welfare measures in the ammended said Policy. Write your suggestion for ammendments in the New Transfer Policy Draft uploaded by NVS , in the Headquarter website. Some guidelines of the suggestions as received from different ends can be seen in the former blog write ups. Please send by email, fax or speed post from your Vidyalaya, GET IT FORWARDED BY YOUR PRNCIPAL to RO for onward transmission to NVS Hqrs as invited by NVS. Last date being 30 Nov,2014 please hurry up ! 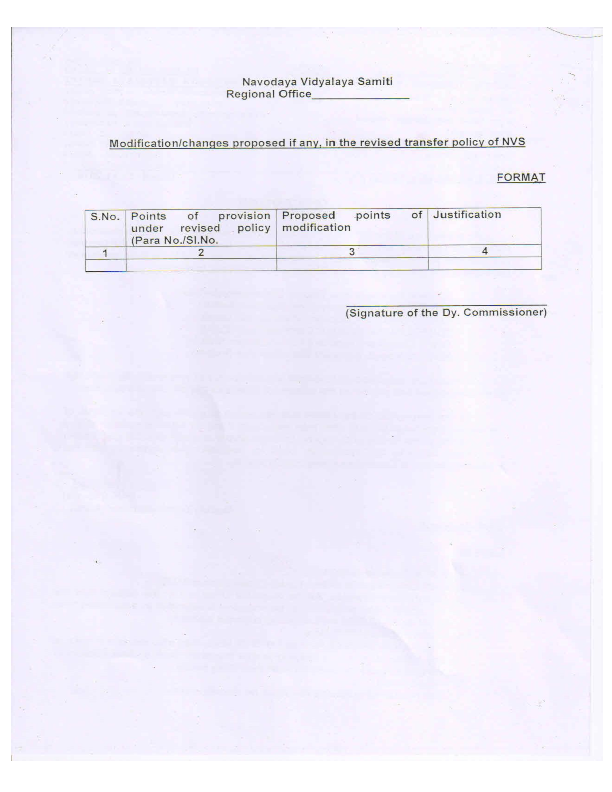 Write as per PROFORMA uploaded in NVS website in a letter format through Proper channel, especially justifying the points and quoting the Clause for it. f) Vacancy position should be displayed by the Samiti in the website. 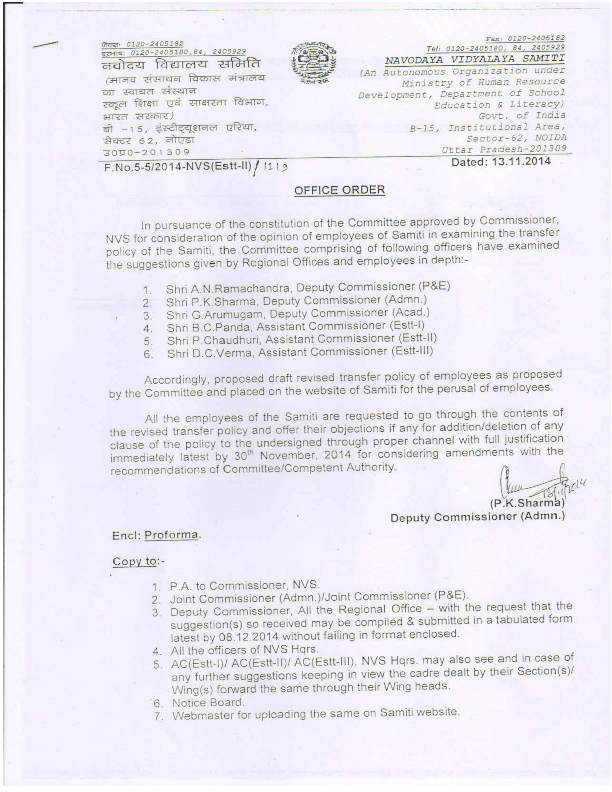 Couples desiring posting under Unification of Spouses category , orders ought to be straightway issued for filling up of thoseVacancies, prior to transfer of employees in other categories., and after filling up of vacancies by those returning from NER & Hard & Very Hard stations. This Spouse category of employees are not required to participate in further counselling process., just like those for North East( NER) & Hard & Very Hard stations, category. g)They should not be waiting till the commencement of online counselling session, but unification of spouses should be and could be done anytime of the year. 4.Vacant posts need not lie vacant till online counselling , it should not be affecting students’ studies. Transfer Policy Revised, see the draft by clicking the link below. Despite HRD Ministry's direction to amend the existing Transfer Policy , by inclusion of Staff opinion and a policy having more transparency, NVS is adamant of making Administrative Transfers and Public Interest Transfers intermittently. AINVSA takes this venture to consolidate a list of recent administrative transfers/public interest transfers done through out all the 08 Regions, and represent in this regard to the concerned grievance cells and departments. Kindly send details in this connection such as database in excel sheet indicating your name, designation, last posting/parent place, present posting or place of admin/public interest transfer, date of joining this new place or if not joined how and where represented etc to Shri TPMani by email (Email id tpmani1959@yahoo.co.in), promptly., with a c.c to sajith_nair12@rediffmail.com. Administrative transfers should not be done in the mid-session, as it disturbs the academics /studies of the students. The administrative transfers or public interest transfers, if any, done in good faith and bonafide reasons, should have been substantiated with Spouse Categories. The paras in Transfer policy on administrative grounds envisages that the administrative transfers should be done to those not conducive to the Vidyalaya atmosphere, after the conclusion of disciplinary proceedings, and should have been reported by the end of March of that academic year. Its found that some vidyalayas have vacant posts of both the spouses. NVS should not feel hesitant in giving transfers to the spouses seeking it in respect of the Unification of Spouse circulars, in line with all the Central,Autonomous, Statutory bodies etc, in compliance to the Personal Ministry circulars to all the Ministries and departments. The spouses could be and should be transferred at any time of the year to make them lead a normal family life, and supporting NVS in filling those vacancies. NVS should adhere to amicable solution such as displacing those who have crossed more than 10 years, in order to set those spouses., to avoid more and more CAT and High Court cases. On the contrary sending those spouses who have knocked the doors of CAT to North east region defies the principles of natural justice., as North east region has been declared as Hard station by NVS and all Central Govt departments. Kindly send the names of both the spouses, designation and name of jnvs where working and where desiring to get posted; provided both the posts are vacant or likely to be vacant clearly mentioning the same at the earliest to Shri TP Mani tpmani1959@yahoo.co.in , by email with a c.c to sajith_nair12@rediffmail.com, the office bearers of AINVSA in their respective Regions, SEC AINVSA office bearers of State etc. LONG LIVE AINVSA ! LONG LIVE T.P.MANI !